.... Heading For Ghana? Frenchman Phillipe Troussier will turn his attention to landing the job of the coach of the Black Stars this evening, after Wales announced the appointment of John Toshack some few moments ago. Troussier was contending the Welsh position with former-Real Madrid coach John Toshack and Dean Saunders after former Liverpool coach Gerard Houllier pulled out of the race. 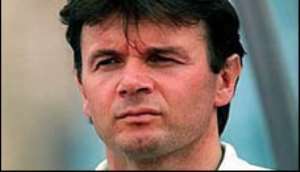 Troussier regarded the Welsh job as priority as compared to the position of the coach of the Black Stars. He is expected in Accra this weekend to continue negotiation with the Ghana Football Association (GFA) over taking the Black Stars job left vacant by Portuguese Mariano Barreto. The sticking point for the GFA has been the amount quoted by the Frenchman. But the appointment of Toshack means that Troussier's options for getting a new job is limited thus would be forced by circumstances to reach an amicable settlement with the GFA. The GFA is also in a fix. It has been reported that Ratomir Dujkovic, a coach with vast experience coaching in Africa and a contender for the Black Stars job has agreed to receive a by far lower salary as compared to what Troussier is demanding.